You Want to Inject What in the Trees? I know I promised to mix up the farm-talk posts with other stuff, but a lot is happening with the farm this month as part of usual fall activities. Don’t worry, a food post is coming shortly. This past week, our grove manager Gary finished injecting the “healthy” trees (aka, the trees we don’t plan to cut down and replace in the immediate future because they’re only minorly diseased instead of severely diseased and on the verge of death) with phosphorous acid (H3PO3). 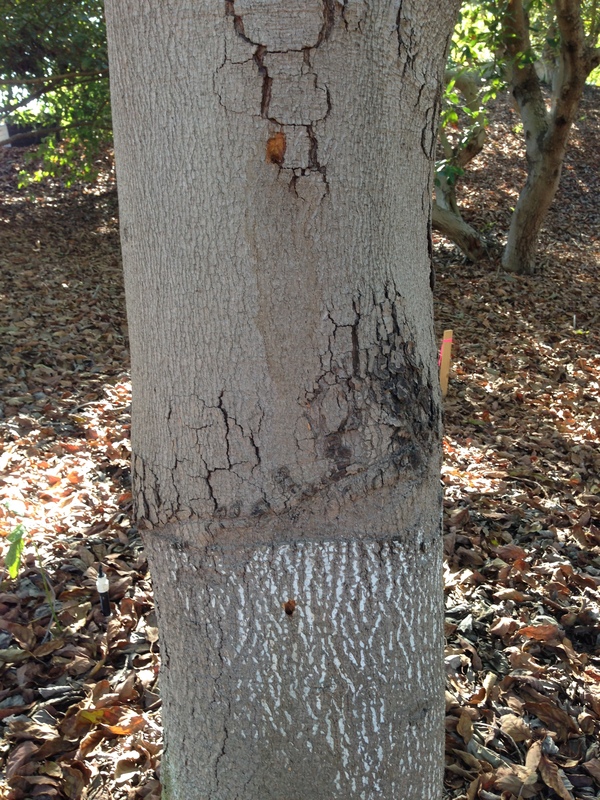 Unhealthy root rot infested trees on left versus recently stumped, healthier trees on right. When he and others first told us of this practice, it seemed counter-intuitive since it involves drilling several holes in the trunk and branches of the trees and pumping burning acid into the holes. Surely, the trees would be severely damaged. But they all assured us that it was indeed necessary to help healthy root growth and fight off root rot (Phytophthora cinnamomi). Oh boy, I thought, another unfamiliar term and something new I have to worry about. I’ll write a future post about root rot. Right now I was more curious about why our manager was injecting acid into our trees and whether it would really help our sick little grove. Upon further examination, it turns out Gary wasn’t really injecting pure acid into the trees. He uses a solution that is 20% acid neutralized with a base to form a phosphonate salt (either potassium or aluminum). 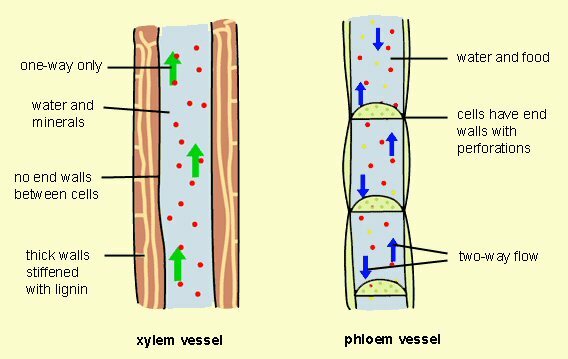 Phosphonates are readily absorbed by the plant systems and move to the leaves through the xylem or to the roots through the phloam (check out fun diagram to the right). Studies in the 1980s demonstrated that phosphonates in feeder roots of avocado trees directly inhibit root rot fungus (again, if you like to geek out on the science, see here) and also stimulate defense mechanisms in plants. 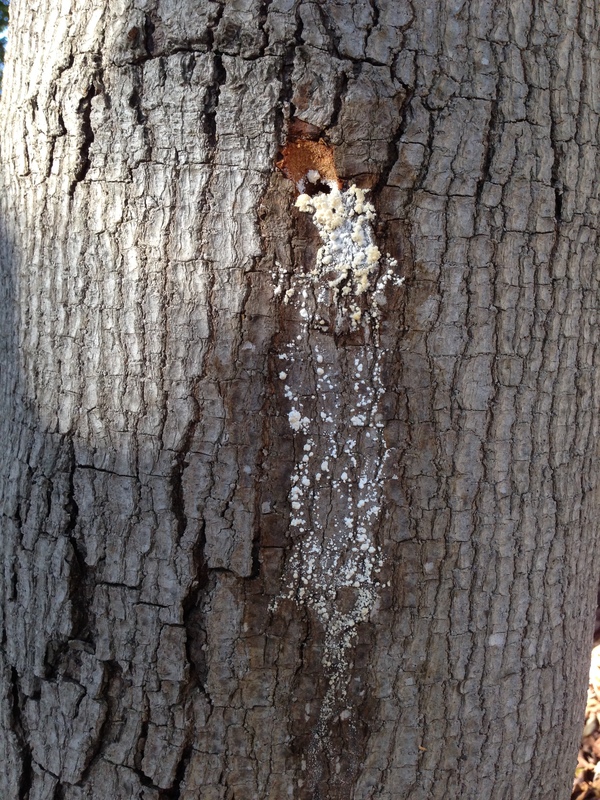 One study even claims that phosphorous acid injections were superior to other biological control agents in improving canopy and root health in infected trees. Injecting the phosphorous acid solution directly into trees is a relatively new cultural practice, started in the 1980s. Phosphorous acid can also be applied by drenching the soil, painting the trunks, injection through the irrigation systems, or as a foliar spray. But trunk injections have been found to be far more effective, economical, and environmentally-friendly. It cost us $3 per tree and sounds much better than spraying a bunch of chemicals everywhere. Timing the injections is extremely important. The whole point is to maximize the amount of phosphonates reaching the feeder roots rather than the canopy. If the trees are injected when new shoots are growing, most of the phosphonates will go to the leaves. So if you wait until after the leaves harden when growth is diverted to the roots, the chances of phosphonates reaching the roots improves greatly. the roots go through two growth spurts a year. Gary just finished injecting our trees last week (late Fall), and he’ll do it again in late Spring. The injections should provide three to four months of root rot control. 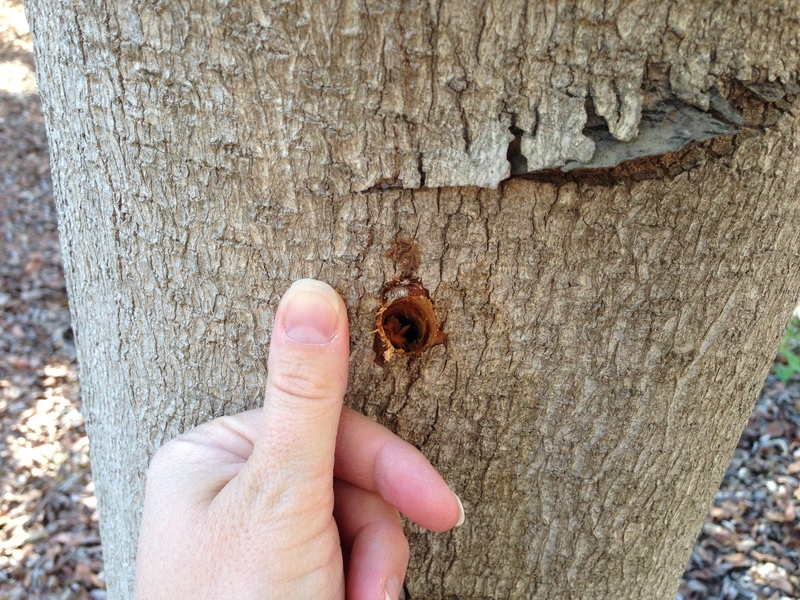 Two injection sites in a single trunk. 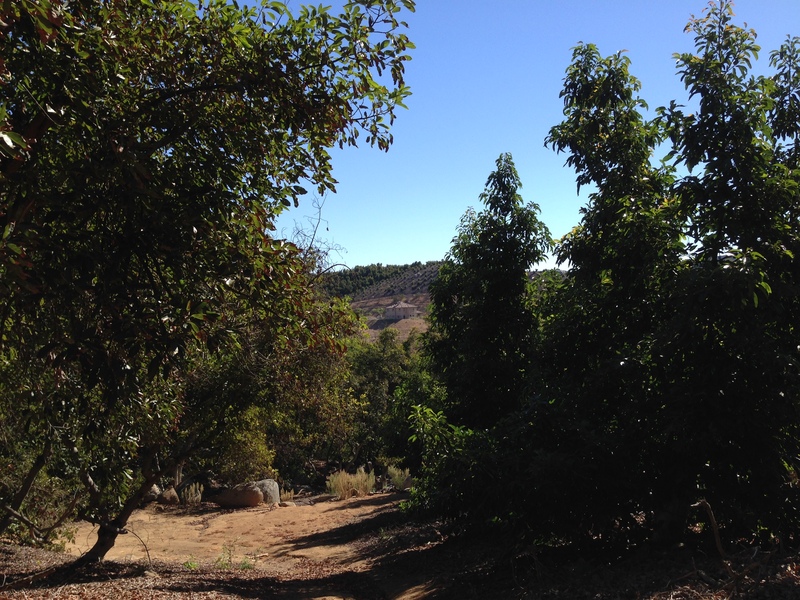 There is debate in the local avocado community on the best way to inject the trees. Gary uses “cold” acid, which requires drilling more holes and filling them with an acid that is less likely to burn. Others use the “hot” acid method, drilling one hole and filling it with a higher acid solution. The hot method can cause greater burning. To inject the trees for cold acid, drill two 7/16 inch wide by 2 inch deep holes in the trunk and alternating limbs. Be sure to angle the drill slightly down so it will be able to hold liquid. Fill each hole with 2 ounces of solution. Managing irrigation well. If the grove is ravaged by root rot, the trees will not be able to uptake the water no matter how much you drench them. Allow the soil to dry out between waterings. Overwatering or waterlogging the soil will accelerate the disease. Using gypsum to help nutrient uptake and minimize the use of fertilizer with large amounts of ammonia. We’ll report on the effectiveness of the injections over the coming year. This entry was posted in Avocado Farming and tagged agriculture, avocado, feeder roots, phosphonate, phosphorous acid, phosphorous acid injections, Phytophthora cinnamomi, root rot. Bookmark the permalink.